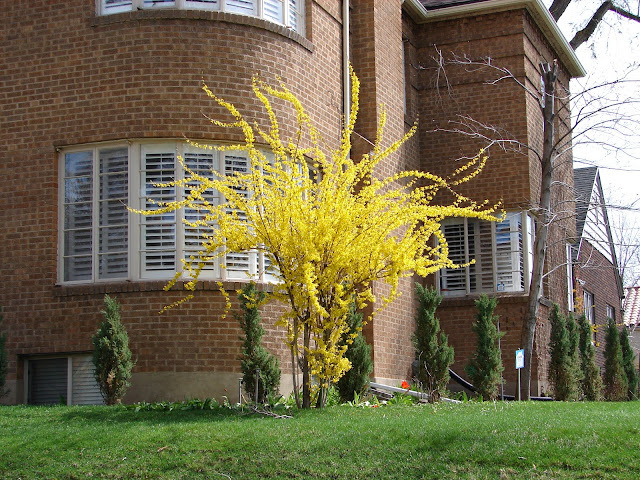 New Utah Gardener: When Is The Best Time To Prune Forsythia? Forsythia is a wonderful shrub that blooms in the spring. It produces long sprays of bright yellow flowers in late March and early April in Utah and is the perfect addition to the spring garden. During the summer in has green leaves and sends out more long fronds for next springs performance. It can be planted as a hedge, but it is better as a focal point. It's natural form is large and open so it does best where it has some space to reach it's potential. The best time to prune Forsythia is right after it blooms - sometime in April or May. The best way to prune Forsythia is to selectively cut old canes out from the base of the shrub. Shearing with hedge trimmers is not advised. This takes away the natural form of the Forsythia which is part of what makes it so beautiful. Then let the forsythia grow during the summer and it will produce next years flowers on the new canes. Please never prune Forsythia (or any spring-flowering shrub) in the fall. Check out this blog post about pruning shrubs. Forsythia blooming in Salt Lake City - pruned correctly provides sprays of color! Hi! Love your blog! I am currently in the beginning phase of my front yard garden makeover. We want to plant native tall grasses, any tips would be appreciated! Thanks!